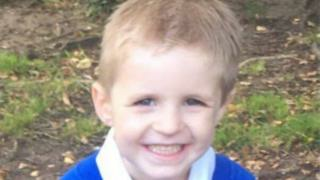 A five-year-old boy who died after being hit by a car has been named locally as Shane Junior Bartlett. He died after he was was struck by the vehicle while crossing Naseby Road, in Bournemouth, on Wednesday afternoon. A crowdfunding page, set up by a relative, has so far raised more than £3,500 to help the family with funeral costs. The car driver, a woman in her 20s, was shaken but unhurt, police said. No-one has been arrested. Previously officers said the boy had sustained a serious head injury and died a short time after his arrival at Poole Hospital. Shane was nearing the end of his first term as a pupil at Winton Primary School. Head teacher Neil Tarchetti said everyone at the school was "deeply distressed and devastated". Donors on the crowdfunding site said Shane was a "cheeky ray of sunshine" with a "beautiful smile".